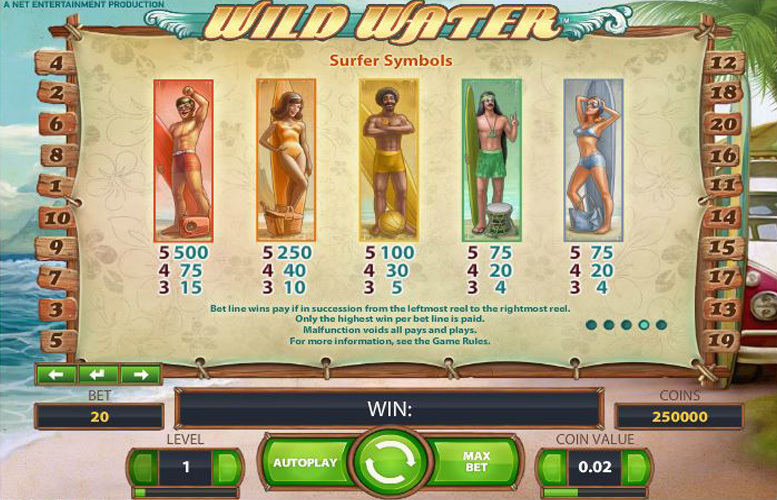 Wild Water is a five reel and 20 payline slot which takes surfing as its inspiration and has a theoretical return to player percentage of 96.4%. Players can tailor their stake amounts by altering both bet level and coin value during a game which boasts wild substitutions, free spins, stacked symbols and two different coin win bonuses. 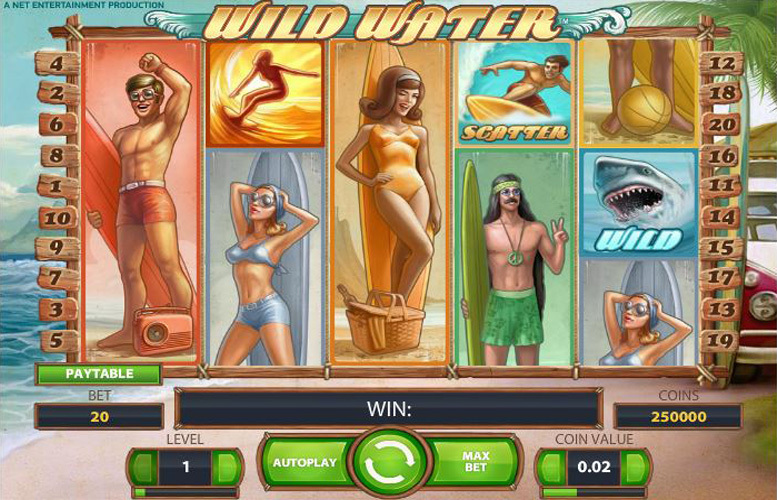 Themed around the ever laid back world of surfing, Wild Water is an interesting and unique slot game. The full review found below aims to let you know everyone you could possibly want to about the slot’s top jackpot, special symbols, paytable and betting limits. There are a number of extra features and bonuses associated with the Wild Water slot but the top jackpot is won in a traditional manner. That is by seeing a combination of five of the most valuable symbols in the game line up along a payline. That most valuable symbol is the special golden surfer symbol, which is not one of the game’s stacked symbols and is worth 2000 times the bet level. At the highest bet level of ten, therefore, a paylinepayout of 20,000 coins will result and if the combination comes up on all 20 paylines at once, the ultimate top jackpot of 400,000 coins will be won. If that jackpot is won when the maximum coin value of 50p is also selected, it means a payout worth a total of £200,000. There are three different kinds of special symbol in Wild Water, which are the stacked surfer symbols, the wild symbol and the scatter symbol. Staked Surfer Symbol – there are five different stacked surfer symbols which can appear anywhere on the reels and will either cover all three, two or just one space on a reel at any one time. If five identical stacked surfer symbols cover all three spaces of all five reels at once, it results in what is called the ‘Surf’s Up’ bonus. That is a coin win bonus worth 20 times the current bet, which will be added to any payline wins. If one of each of the five stacked surfer symbols cover all three spaces on the five reels at any one time, this results in the ‘Surf Team’ bonus. That is the game’s second coin win bonus, is worth 200 times the current bet and is once again added to any payline wins. 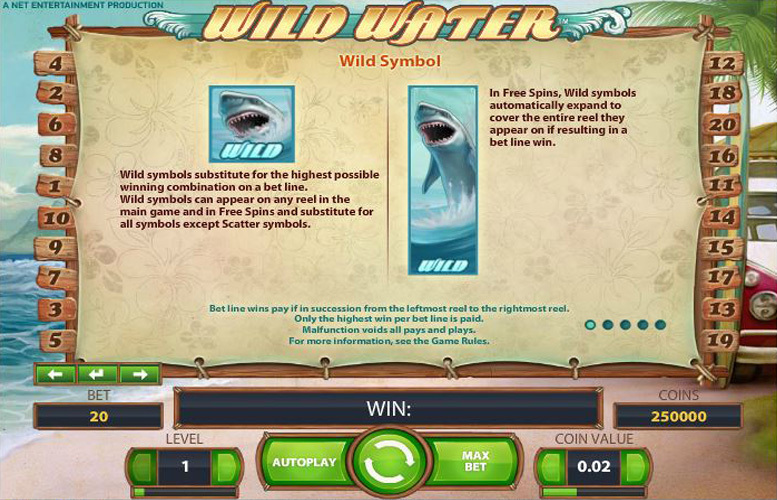 Wild Symbol – the game’s wild depicts a shark and works in a traditional manner. It can appear on any reel during the main game and during free spins, substitutes for all symbols apart from the scatter and always goes towards creating the most valuable possible payline combination. The wild cannot, however, substitute for stacked surfer symbols to trigger either of the above bonuses. 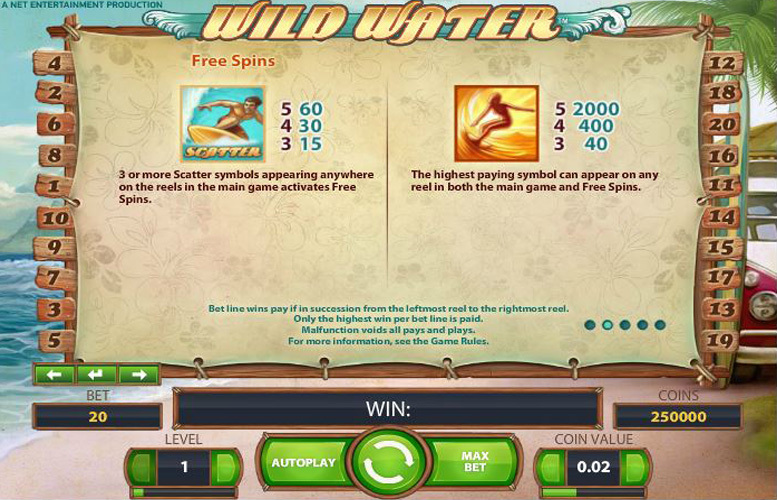 Scatter Symbol – finally, the Wild Water scatter is the symbol that can activate free spins. Three or more scatters appearing anywhere triggers the free spins and the number awarded is set down in the game’s paytable. The free spins are played at the same bet level and coin value as the spin which activated them and additional free spins cannot be won during free spins themselves. The majority of Wild Water’s symbols are three space stacked surfer symbols, but the most valuable symbol of all is not one of these. It is in fact the regular sized golden surfer symbol, which is worth an impressive 2000 times the bet level for a combination of five across a payline. That means a potential payline jackpot of 20,000 coins if the highest bet level of ten is selected. An overall top jackpot of 400,000 coins, furthermore, is possible if that most valuable combination appears on all 20 paylines at once. After that symbol, the next most valuable is the red stacked surfer symbol. A five symbol combination made up of that symbol is worth 500 times the bet level and can, therefore, result in a paylinepayout of 5000 coins and an overall top jackpot of 100,000 coins if the symbol covers all paylines. If that symbol does cover all spaces, what’s more, it will also trigger the ‘Surf’s Up’ bonus which at bet level ten is worth an additional 4,000 coins. All 20 Wild Water paylines are always active but players can control the amount they stake per spin by altering both their bet level and coin value. There are six available coin value settings between 1p and 50p, and ten bet levels from 1-10. Coin value determines how much each coin wagered is worth and bet level stipulates how many coins are staked per payline. Setting the lowest possible coin value of 1p and bet level of one, therefore, results in a minimum stake of just 20p. Choosing the highest coin value and bet level alternatives of 50p and ten respectively, meanwhile, result in the maximum stake of £100. 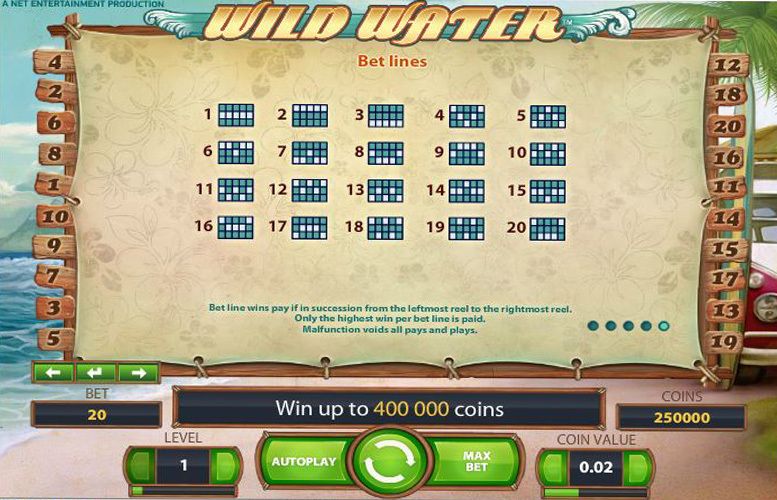 Wild Water is a slot which offers players plenty of interesting features, fun symbols and generous jackpots but is not without its faults. To deal with positives first, the game’s innovative stacked symbols and connected bonuses are undoubtedly fun and potentially rewarding. What’s more, the top potential jackpot of 400,000 coins is comparatively generous, especially if it is won when a coin value of 50p has been selected. Control over betting limits, too, is largely in line with that offered by all other slots, meaning that players of all budgets can enjoy the game. This game has a rating of 4 / 5 with 463 total reviews by the users.